While coral reefs throughout the world have been unable to survive for years due to continuous climate change, coral reefs in the Red Sea seem to be an exception. What enables certain species of coral reefs to live and thrive in the naturally warm waters of the Red Sea? Can these discoveries be applied to all coral reefs as climate change alters natural ecosystems? Figure 1. Thriving underwater coral reef. Courtesy of joakant, 2009, Pixabay. Public Domain. Coral reefs throughout the world have experienced the detrimental impacts of climate change.2,3,5,6,7,9,10 As Earth continues to warm, it was thought that coral reefs around the world would eventually disappear.10 However, scientists recently discovered large populations of coral reefs thriving in the deep waters of the Red Sea, which is a continuation of the Indian Ocean between Asia and Africa (Figure 2).1,2,6,7,8 Coral reefs in the Red Sea are surviving in upwards of 20°C waters, temperatures that were previously thought by scientists to be too warm for coral reefs to survive.7,8 These coral species are already adapted to the naturally warm waters of the Red Sea, and are therefore not disturbed by the recent rise in global temperatures, which is causing mass bleaching events.1,2,3,6 Scientists previously thought coral reefs only resided in water temperatures below 12°C, but the recent discovery of flourishing coral reefs in the Red Sea, one of the warmest bodies of water on Earth, refutes this notion.7 This new finding has provided scientists with hope that coral reefs will endure future climate change and continue to prosper on Earth. Climate change hinders crucial processes that occur for coral reefs to survive and flourish.2,5,9 Increasing air temperatures on Earth subsequently cause water temperatures to rise, creating an unlivable environment for many coral reefs.2 Damage to the reefs typically occurs when water temperatures surpass the region’s average summer air temperature by 0.5-1.5°C (0.9-2.7 °F).2 Specifically, these high water temperatures cause the process of bleaching to occur.2,4,5,7,9,20 Bleaching weakens the symbiotic relationship between the coral and the Symbiodinium dinoflagellates, algae that lives in the coral’s tissues and provides energy to coral reefs.2,4,5,6 The reduction of energy transmitted to coral reefs decreases calcification rates, a process vital for the construction and existence of coral reefs.2,7 If destruction of coral reefs is occurring quicker than construction, coral reefs will eventually cease to exist. However, the discovery of coral reefs residing in the inherently warm Red Sea may give researchers hope for the future. By studying the characteristics of coral reefs in the Red Sea, scientists can determine how they are surviving in warmer water, and this may led to a breakthrough that can save other coral reefs around the world. Figure 2. 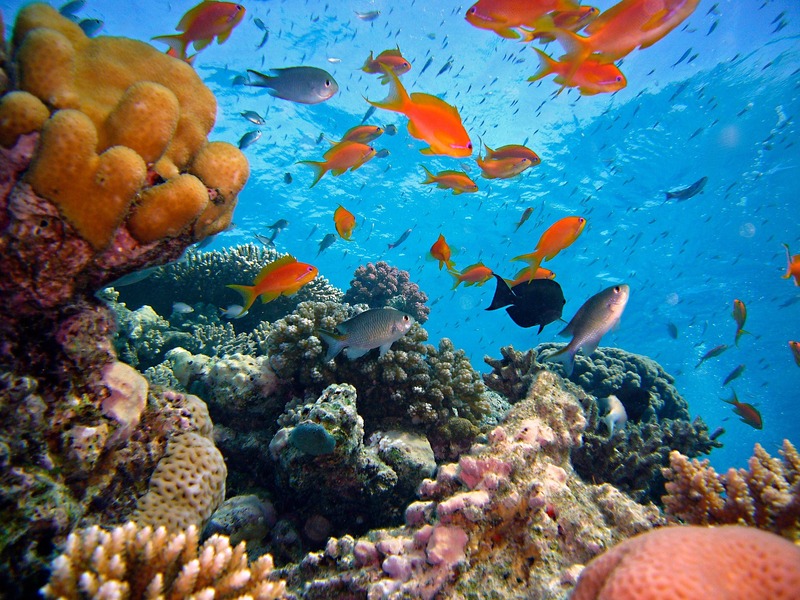 Coral Reefs located near the Red Sea. Courtesy of Lubiesque, 2013, Wikimedia Commons. CC BY-SA 3.0. Figure 3. Change in Sea Surface Temperature, 1901-2015. Courtesy of U.S. EPA, data from IPCC and NOAA, 2016. Public Domain. In a more recent study, the coral species Pocillopora verrucosa was observed in six different reefs throughout both the northern and southern regions of the Red Sea.9 The researchers’ goal was to understand the necessary biological processes used by the coral in warmer temperatures. An in situ study was conducted where pieces from each of the six coral reefs were taken, placed in incubators, and then measured in both the winter and summer.9 Researchers focused on genetic aspects, calcification and respiration rates, and photosynthesis rates of each coral species.9 The results displayed high acclimatization to the water temperatures that nearly exceeded 31°C, but very little genetic adaptation.9 This discovery indicates that the differences between coral reefs in the Red Sea and coral reefs elsewhere were phenotypic rather than genotypic.9 Additionally, calcification rates were highest in temperatures ranging between 28°C-29°C (82-84 °F), temperatures formerly believed to be too warm for coral reefs.9 This finding demonstrates that the Pocillopora verrucosa did not necessarily need to adapt to the water conditions of the Red Sea, but needed to make changes in its processes, implying this species has high plasticity.9 Contrary to the Roder et al. study, the analysis of the Pocillopora verrucosa indicates that coral reefs in the Red Sea have not previously adapted to warmer temperatures, but rather formed the ability to maintain essential processes by changing how they survive.9 While there are no definite answers, studies targeting different species of corals living in the Red Sea offer researchers a glimpse as to how these corals are surviving and continuously changing with their environment. The discovery of coral reefs in the Red Sea contradicts the belief that corals cannot survive in temperatures above a certain threshold.1,2,3,7,8,9 Even with relatively few studies conducted, researchers now have an idea of what separates the unique corals of the Red Sea from corals living in colder temperatures.2,3,7 The corals in the Red Sea are accustomed to above-average temperatures, and are not affected by the detrimental impacts of climate change.1,2,3,7 Although climate change is one of the most harmful factors to coral reefs today, Red Sea corals may provide possible solutions to combat the demise of coral reefs worldwide. Fine, M., et al. (2013). A coral reef refuge in the Red Sea. Global Change Biology, 19(12):3640-3647. Maor-Landaw, K., et al. (2014). Gene expression profiles during short-term heat stress in the red sea coral Stylophora pistillata. Global Change Biology, 20(10):3026-3035. Nir, O., et al. (2014). Seasonal Mesophotic Coral Bleaching of Stylophora pistillata in the Northern Red Sea. PLoS ONE, 9(1):1-8. Roder, C., et al. (2013). First biological measurements of deep-sea corals from the Red Sea. Nature Scientific Reports, 3(2802):1-10. Sawall, Y., et al. (2015). Extensive phenotypic plasticity of a Red Sea coral over a strong latitudinal temperature gradient suggests limited acclimatization potential to warming. Nature Scientific Reports, 5(8940):1-9. Weijerman, M., et al. (2015). An Integrated Coral Reef Ecosystem Model to Support Resource Management under a Changing Climate. PLoS ONE, 10(12):1-23.
joakant. (2009). [Photograph of coral reef. Retrieved from Pixabay. Public Domain. Lubiesque. (2013). 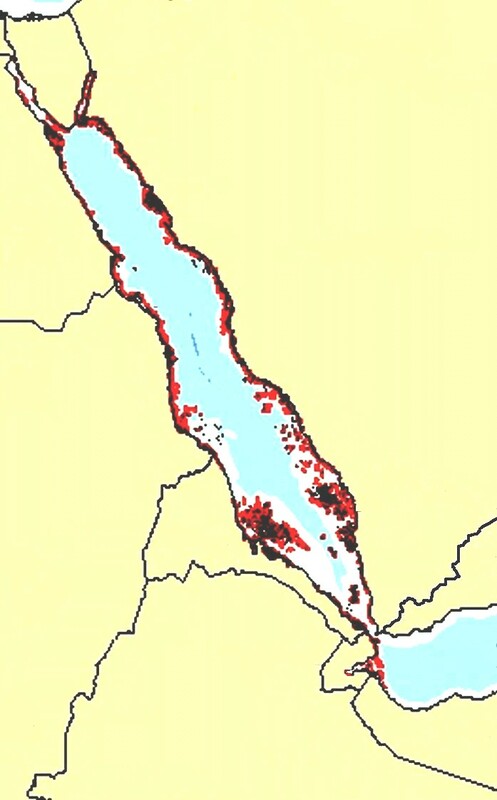 [Graphic of coral reefs in the Red Sea area]. Retrieved from Wikimedia Commons. CC BY-SA 3.0. United States Environmental Protection Agency. (2016). 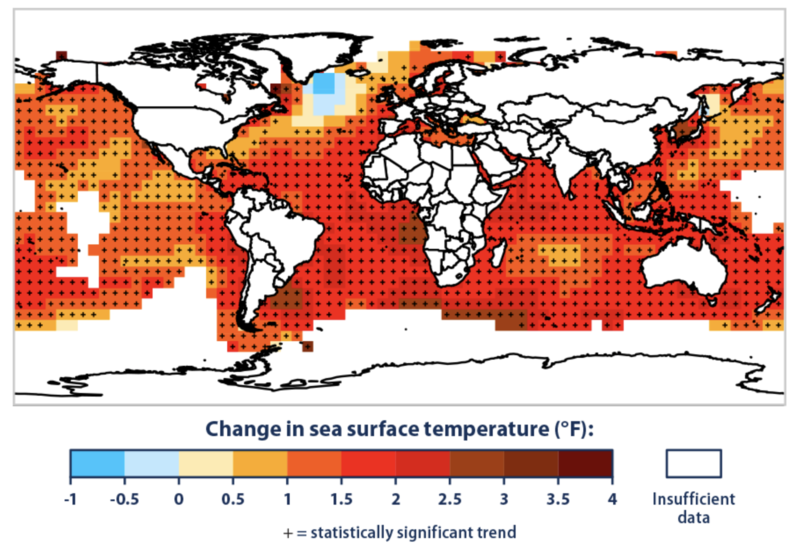 [Map of change in sea surface temperature]. Retrieved from https://www.epa.gov/climate-indicators/climate-change-indicators-sea-surface-temperature. Public Domain.